Brett James Phillips has had a guitar in his hand every day since he discovered his passion in high school. Brett has taught in the Phoenix area for thirty years. 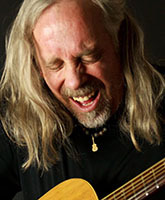 Many of his students have gone on to play professionally and his love of guitar is contagious as many of his students are still playing and enjoying the guitar into adulthood. Brett loves working with students of all ages and ability levels. He loves working with the brand-new, young beginner up to the aspiring professional. He’s well-versed in many styles from classical to rock. 1. Played tuba in high school. 2. He’s an Eagle Scout.